LAPD Detective Erin Bell (Nicole Kidman) seems to have spent the night in her car under a bridge. Certainly looking a lot worse for wear, she staggers from her car to the crime scene nearby where a dead man lies face-down and she recognizes his by the tattoo on the back of his neck. The victim was part of a notorious criminal gang in California that, seventeen years previously as a young police officer, Bell was working undercover with alongside partner Chris (Sebastian Stan). There was also a message in the form of dye-stained bank notes left with the body. Silas (Toby Kebbell), the disturbingly dangerous leader of that gang has also sent one of those dye-stained notes to Bell’s office, so this means that he must have resurfaced after disappearing all those years ago. This also means she must revisit her past to solve the mysteries of the present. Bell becomes rogue and refuses to reply to calls from headquarters as to her whereabouts as she tries to track down Silas. She is determined to face her demons, get her long-awaited revenge and, along the way, reconnect with her 16 year-old daughter Shelby (Jade Pettyjohn). If the outline seems familiar, that is because it is, but the central character is usually a male. The distinctly unkempt and frequently inebriated Bell tracks down the rest of the gang in order to locate Silas who is also seeking revenge. So, as flashbacks fill in the back story of a robbery that goes disastrously wrong, you know the two of them are heading for a final shoot-out. Sleep-deprived, never eating and continually covered in grime, the present-day Bell is the antithesis of her fresh-faced self seventeen years previously. 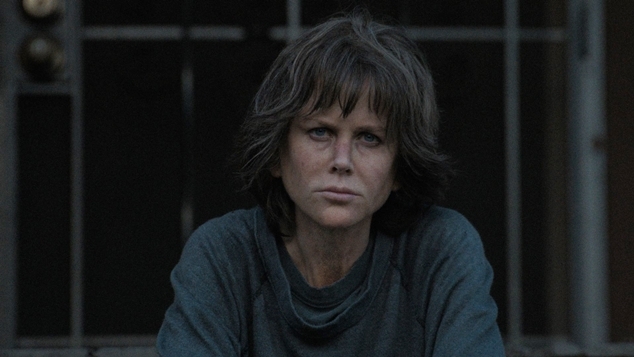 This rough, violent and reckless vigilante is certainly a different role for Kidman, and guaranteed to bring awards. Director Karyn Kusama threw actor Michelle Rodriguez into the boxing ring in her previous film Girlfight, about a young woman who was determined to be a boxer. The women in both films know how to defend themselves and have to take all the punches that are coming to them in uncompromising violent worlds. Rated MA 15+, Destroyer screens from Thursday 21 March.